You can expect to see blooms in 6-12 weeks, after planting your Spotlight amaryllis bulb. Amaryllis How-To: Ever grown an amaryllis inside the house? It's a snap. There can be rain, cold and snow outside, but all you do is plant the bulb in a pot, water this "magic lily", and watch it zoom into growth. Eventually, enormous flowers begin to open - huge lily blooms up to 8" across! Each bulb produces one or two stems, with 3 or 4 flowers appearing on each stalk. These long-lasting blooms will provide a big show for over a month. 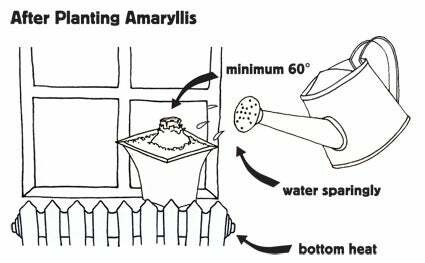 Planting Amaryllis: Choose a standard size flower pot, so the large bulb has approx. 1" around sides and at bottom. (These bulbs do not need much root space.) Use soil, or a mixture of soil, peat and perlite. (Do not use pine bark.) Place bulb so top inch or so of bulb sticks up out of the soil. 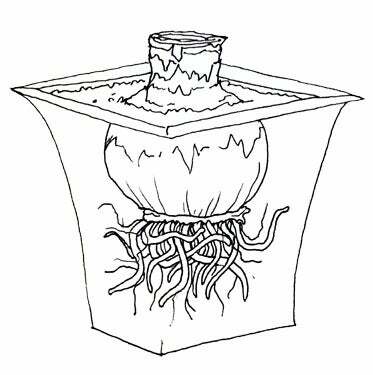 Place the pot with your freshly-planted bulb on top of the refrigerator, radiator, or other spot that provides 'bottom heat' to encourage quicker sprouting. Watering:Water sparingly until the sprout is well out of the bulb. Once sprout appears, water regularly, but do not overwater. Your amaryllis will grow quickly and produce its spectacular huge flowers. 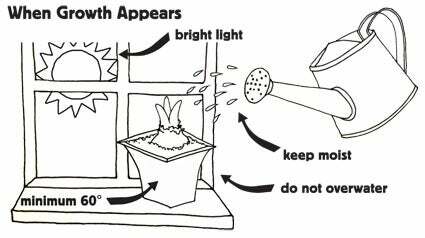 Remember to keep turning the pot regularly to make the stalk grow straight, as they have a tendency to grow and bend towards the light. Once in flower, it's best to keep plant out of direct sunlight to keep the blooms from fading. Simply remove each flower as it begins to pale. Your bulb will produce several flowers. Aftercare: When all flowers are gone, cut off the tubular flower stems near the top of the bulb, leaving the foliage to continue growing. Water as usual and apply water-soluble fertilizer every four weeks. In spring, after danger of frost, sink the Amaryllis pot in the garden in a sunny place for the summer. Continue to fertilize. At the end of the summer, place the pot on its side and allow the soil to dry out. Cut off the dry leaves, and in about six weeks repot your bulb in fresh potting soil and start the growing cycle all over again.